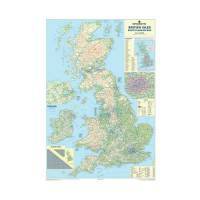 Map Marketing British Isles Motoring Laminated Map BIM Pack of 1 "British Isles Motoring Map. Motorways, primary and A and B roads depicted with insets showing Greater London main routes and a mileage chart. Size: 50x35. Scale - 12.5 miles: 1 inch." 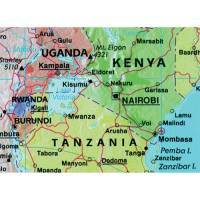 Map Marketing Giant World Political Laminated Map GWLD Pack of 1 Giant world political map featuring countries clearly defined with political colouring. Main cities and towns clearly marked. Time zone clocks. Country flags and statistics. 1200mm x 1840mm. Laminated.